August 31, 1975, J. P. Pelham. 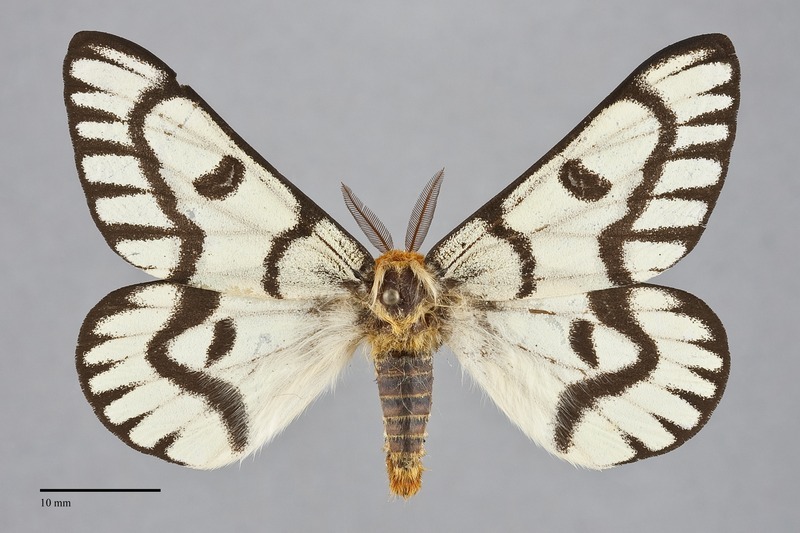 Hemileuca hera is a very large white day-flying moth (FW length 34–37 mm; wingspan 6.5–9.2 cm) with black markings that flies in sage steppe habitats during late summer. Both wings are similar pure white, with black edges, smooth antemedial and postmedial lines, large ovoid discal spots, and triangular marks on the veins at the wing margin. Portions of the hindwing lack black marks in some individuals. The body is deep yellow, with black-ringed abdominal segments. The antennae are widely bipectinate in males and narrowly bipectinate in females. This is the only Hemileuca with entirely white ground color in our region and can be recognized easily by its large size, white color, and thick black markings. It is unlikely to be confused with any other species. 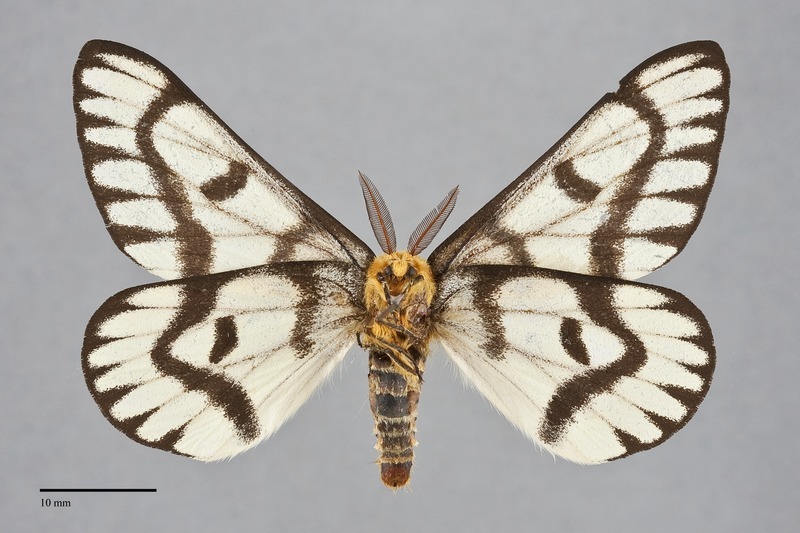 Hemileuca nuttalli has a white forewing and is patterned with black; however, it has a bright yellow hindwing. Populations of H. hera are divided into three subspecies by Ferguson (1971). Most of the Pacific Northwest has the nominate subspecies H. h. hera. The distinctive Hemileuca hera marcata (not illustrated) was described from Ft. Klamath, Klamath County, Oregon as Pseudohazis hera var. marcata Neumoegen. This subspecies might be more widely distributed in Oregon and northern California. 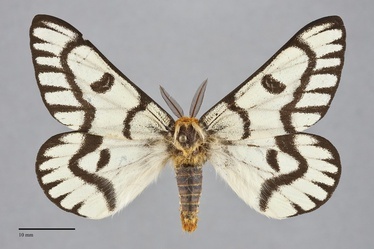 It is larger and has more pointed wings than H. h. hera, and the black markings are reduced on the hindwings. The body is purplish-black with dorsal and subdorsal black spines. The spines are surrounded by whorls of orange hairs. The body is marked with three white longitudinal lines on each side. The larva is illustrated by Tuskes et al. (1996). This species is often common to abundant in subalpine sagebrush meadows at higher elevations in the Rocky Mountain region, Great Basin sagebrush rangelands at low elevations, as well as in pinyon-juniper woodlands at middle elevations east of the Cascades. Hemileuca hera is found in sagebrush habitats in extreme southern British Columbia, the Columbia Basin, southern Oregon, and southern Idaho. Hemileuca hera is widely distributed in the American West. It occurs from southern British Colombia and northern Wyoming south to western Colorado, central Utah, and southeastern California. The eggs are layed in rings on twigs of the host plants. They overwinter and hatch in April and June. This species is a foodplant specialist on sand sagebrush and big sagebrush (Artemisia spp.) in the Asteraceae. Young caterpillars feed together but become solitary as they age. Loose cocoons are made in leaf litter or in soft soil. Pacific Northwest specimens have been collected from mid-July to late September but are most commonly encountered during August. The adults are diurnal and have a rapid flight several meters off the ground making them difficult to catch. Like other members of the family Saturniidae they do not feed as adults.